Did you know that people who live in waterfront properties feel more relaxed, tranquil, and report being happier more often than individuals who don't live near the water? When it comes to finding waterfront properties for sale, there are several factors that you will want to consider. For example, do you want to live near the ocean, on a lake, or perhaps you prefer hearing the tranquil gurgle of a slow-flowing river? No matter what type of waterfront property you are interested in owning, you will love living in a home that is intricately connected with nature. Living on a lake offers homeowners a few unique perks that neighborhood life simply can't offer. Enjoy privacy without feeling completely secluded - Living beside a lake offers homeowners a chance to enjoy nature, while still knowing that their neighbors are located close-by. 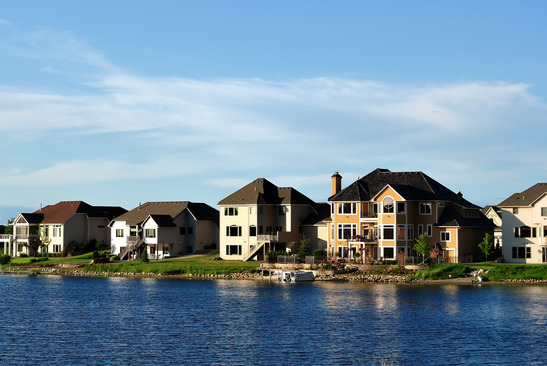 Often times you will be able to see your across the lake neighbors from your dock; however, zoning laws will often keep you from peering directly into your neighbor's home. Cooler temperatures during the summer - Lake residents enjoy the perks of slightly cooler temperatures during hot and humid summer weather. Enjoying your own personal aquatic playground also has its perks. Winter ice-skating - Since we had a note about the summer perks, we figured we should add in the fun winter sport of ice-skating. Depending on winter temperatures, living on a lake gives you easy access to ice skating, snow shoeing along the coast, and potentially cross-country skiing across the frozen lake. Living in a riverfront property definitely has its perks. Improved tranquility - It should come as no surprise that one of the best perks to living on a river is the sense of tranquility that it inspires within homeowners. Did you know that river sounds are even used within sound machines to encourage a good night's rest? Say goodbye to a bad rest and hello to your new swinging hammock by the river's edge. Connect with nature - Living on a river will offer you a chance to become better connected with nature. Rivers provide easy access to numerous species of birds, plants, fish, and local wildlife. When it comes to lake houses for sale and other waterfront properties for sale, you will want to make sure that you adhere to the following tips. Consider the property more than the structure - Remember that when it comes to living on the water, you can always improve the house but you can't enhance the view of the natural swimming conditions. Have your loan in order before you begin to work - Since waterfront homes for sale can be slightly more expensive than their land counterparts, you will want to make sure that you are pre-approved before you begin to shop around. for sale will be better equipped to answer your questions about property building restrictions, zoning laws, and any other information that you might want to know about the area. We invite you to contact us with any questions that you might have as you continue on your search of waterfront homes for sale. We look forward to helping you find your waterfront dream home!